How disgusting is it for a woman to run her hands through your hair only to get tangled in your messy, unkempt tresses or find that your hair has enough oil to fry an egg? It's DISGUSTING. And we cannot stress enough how important hair maintenance is! And maintenance really includes just two basic steps. Many men are not particular about what kind of shampoo we use or the importance of including conditioner in your washes. What we do is grab a bottle of shampoo, whichever nearest to us from the sundry store and use it. It may very well be soap, and some may not even notice-- Or care! Well, I'm here to finally tell you; You're Wrong! Shampoo type is important, although not many men realise this. And unless you want your hair to play host to dandruff or be drenched in oil, I suggest you start paying attention to what kind of shampoo and conditioner is suitable for your hair type. It doesn't take a genius to choose the right shampoo for your hair care, it really involves common sense and a little sacrificed time in reading the labels. If your hair is dry, don't use a shampoo that removes oil -- you're gonna dry out your scalp and end up looking like a walking broomstick. Use normal shampoo and conditioner and it's fine to wash frequently. And if you're wondering if it's OK to skip the conditioner, it's NOT. Every man should own a bottle of conditioner (Suitable for your hair type!) because it is a necessity for a healthy scalp. And a healthy scalp means healthy hair-- and not enough men know that. How Often Should We Get A Haircut? Sure you think looking like a rock star from the 80s is cool, with the messy mane and all. But there's a reason that hairstyle stayed in the 80s. 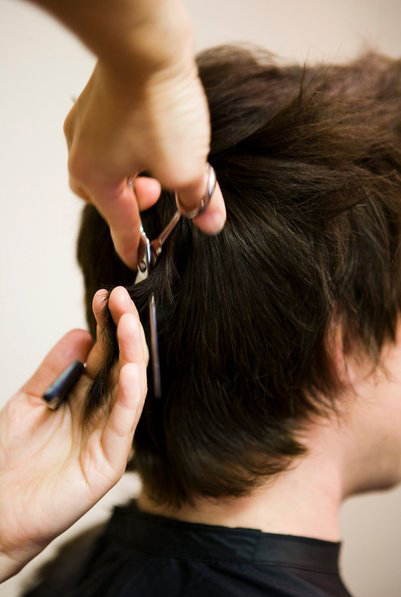 Haircuts should generally occur every 4 to 6 weeks if you want to look your best. After this period, hair generally starts to lose its support and maintain its shape. And you hear women moaning over split-ends? Trust me, it's not gonna look any better on you. Get a trim and keep your hair short and sweet.